Aussie brand, Souls Massage Thongs, celebrate their 10th anniversary this summer season, with the release of a brand new range of styles, patterns and vibrant colours to add to their existing range of massage thongs. 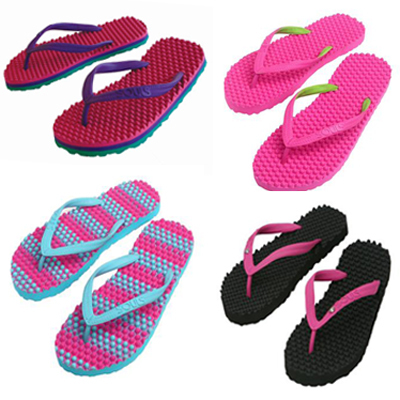 Using therapeutic massage "bubbles", the foot-bed of Souls Massage Thongs mould to your feet as you walk and the masseur bubbles act as pressure points to massage your feet and stimulate blood flow with every step. "I was involved in a car accident in December 2006 and had suffered with my left foot, and could not wear any flip flops because of the thin flat nature of them," says loyal Souls Thongs customer, Simon Williams. "Souls Thongs really do make a difference to my feet and have made walking long distances a pleasure, which I could not do before," he says. Available in a range of vibrant colours, Souls Massage Thongs are made for men, women and children and also design a range of flat based "Tribal" thongs, ensuring there is a style to suit all personalities. "We understand that variety is important," says Souls Thongs Director, Andrew Johnston. "The release of the Souls Tribal range a couple of years ago - a flat based style thong - was just a natural extension of the Souls brand, so we had styles to suit everyone". Marking their 10th anniversary this coming summer, Souls Thongs are releasing an exciting new range of thongs in September. The new Souls range will include the latest colour styles for the "original" massage thong along with the new season styles for the Souls Tribal range. To celebrate their 10 year anniversary, Souls are putting a whole new spin on the massage concept, with the release of a completely new massage style thong. "We've altered the masseuse bubbles on the foot-bed of the thongs to create a different massage technique," says Andrew. "Our new massage design is less elevated, softer and more forgiving, which will be a benefit to people with more sensitive feet. "We've discovered over the years that everyone's feet are different and some are more sensitive to touch than others. We have developed the new massage thong to help people with sensitive feet so they too can enjoy the Souls experience," says Andrew. Kind to your feet and to the environment, Souls Thongs are committed to eco-friendly manufacturing. All Souls Massage Thongs are made from an EVA foam and natural rubber combination - both non-toxic and environmentally friendly materials. "Our Souls manufacturing facility is a REACH certified manufacturer, which means it adheres to strict European standards of manufacture and no child labour is used. All our thongs are made from up to 20 percent recycled material and all off-cuts from production are recycled through our onsite recycling plant, to make more thongs and other rubber type products," says Andrew. "We are certainly very aware of our social responsibility and execute sustainable business practices wherever possible." Souls are great, although initialy they take a little getting used to, you will be thankful at the end of the day.